Woke at six, showered and walked Mix before setting off with Rachel to Berwick where we parked before catching the eight-ten train to London. This is a good train – it has few stops and we were in London by twenty to twelve. Reaching Marble Arch, we crossed to Speakers’ Corner in Hyde Park – I recalled speaking there at a rally in the 1960s) – and made our way to the Serpentine which we followed along to Green Park. Form here it was a succession of tourist destinations which Rachel hadn’t seen for many years. We were taken with the Australian War Memorial, we saw Buckingham Palace, we walked down the Mall to Admiralty Arch, we saw Rotten Row and looked over St. James’ Park to Big Ben and the Houses of Parliament and we lunched at a Prete a Manger on Trafalgar Square looking up at Nelson’s Column and across at his lions. After lunch we caught a tube from Charing Cross to Piccadilly Circus which we explored before getting back on the tube. I had intended us to move on to Covent Garden but there was a problem with the Piccadilly line (someone on the line we were told) and so we retraced our steps to Embankment from where we caught a tube to Mansion House which was just a short walk to St. Paul’s and then across the Millenium Bridge to the Globe. At the Globe we were just in time to catch a tour of the theatre and, more interesting to us because we already knew the theatre, a lecture on its story and the opportunity to explore the fabulous exhibition centre there – the exhibition tells the story of the original Globe (and the one which replaced it when it got burned down) as well as the project which led to the existing Globe. A wonderful story and a great deal to see. Coming in out of the cold, we arrived at the Swan restaurant, part of the Globe complex, where we had a really good meal – I had soup, followed by salmon fishcakes with salad, chips and cauliflower cheese, followed by black forest meringue, washed down with ginger beer. It was now time to make our way to the theatre. 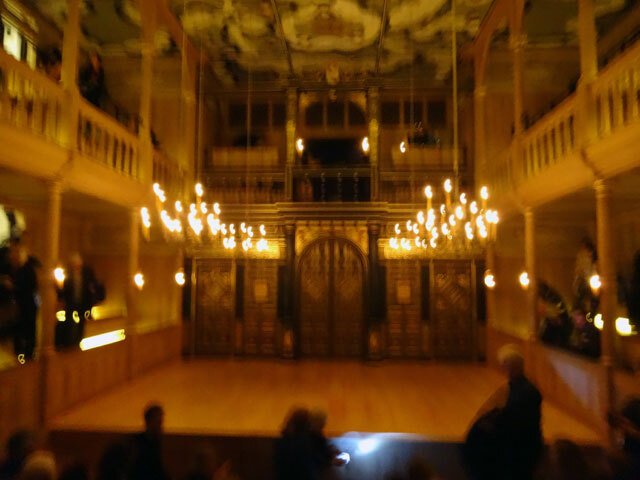 It is called the Sam Wannamaker theatre, after the person whose vision it was to rebuild the Globe. While the Globe reflects a best guess at Shakespeare’s theatre in the outdoors, the Sam Wannamaker Theatre is an inside theatre from a little bit later. The theatre took my breath away. It is small (seating just three hundred and fifty people around the stage). It is lit entirely by candle-light. There are six chandeliers each with twelve candles in them and an additional four holders for two candles each. The actors also carry candles with them but the light is changed, as is the whole set really, by the raising and lowering of the candelabras. By chance Rachel and I were in the best seats in the house, right in the middle with no one in front of us at all. Obviously one can’t take pictures during the performance so I must leave it to your imagination – it will certainly live on in mine -- aided by my puny effort at the head of this entry. The play was ‘Tis Pity she’s a Whore (written by John Ford and first performed in 1629) and the production and performances were beyond anything I can readily describe. It captivated me from the moment it started until the final drop of blood was shed as the play reached its gory conclusion. We walked back to London Bridge tube station and caught the tube to Euston Station in plenty of time to catch the 11.50 p.m. sleeper to Scotland. There is something so cosy about a sleeper and the motion of the train is a wonderful way of being lulled to sleep.